Made using 6mm round white howlite beads. 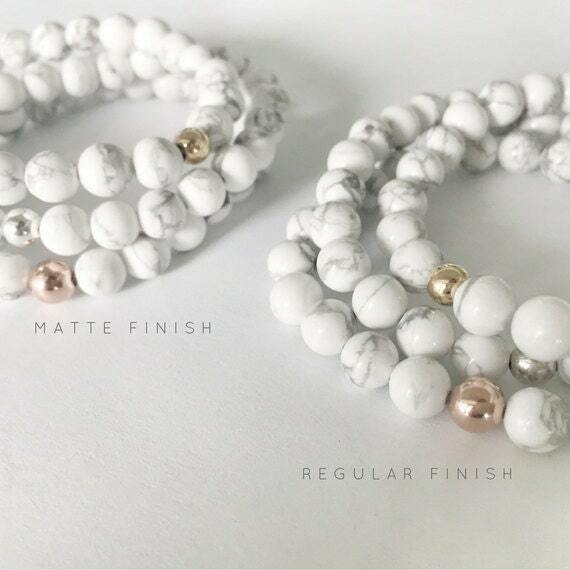 Each howlite bead is carefully selected to achieve a white marble effect. All beads are individually selected and polished before stringing. 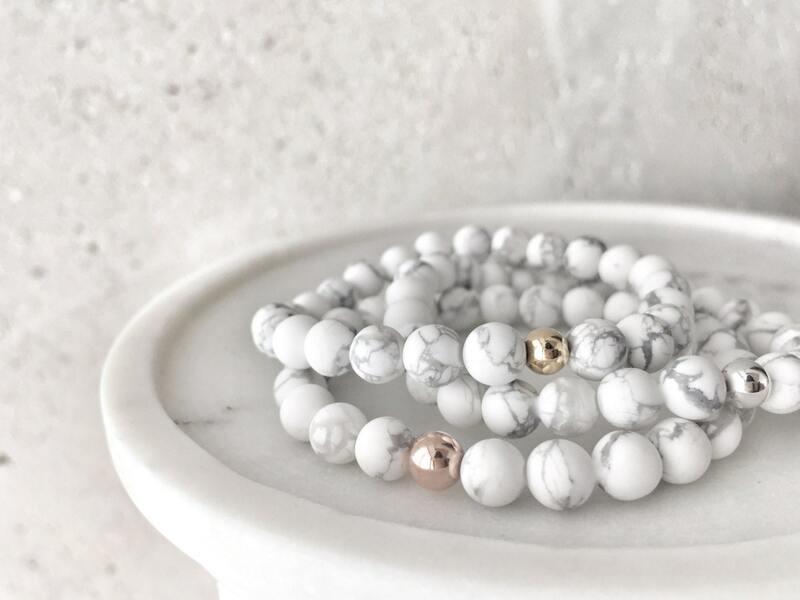 Create your own custom stack by layering other pieces from the collection or shop the [Bracelet Stacks] section for curated stacks. Each QUINSCO piece is made true to size. The philosophy behind QUINSCO takes after my own personal style esthetic, that is: simple, chic, and always put together. The pieces that embody my collection are designed to be versatile so that you can mix and match them to create tailored and personalized looks. Every piece is delicately handmade by yours truly and since I’m a firm believer in "quality over quantity”, I treat every single order as if it was my first. Rest assured that I’m very passionate about my craft and that I will always strive to ensure my customer’s happiness with their pieces! 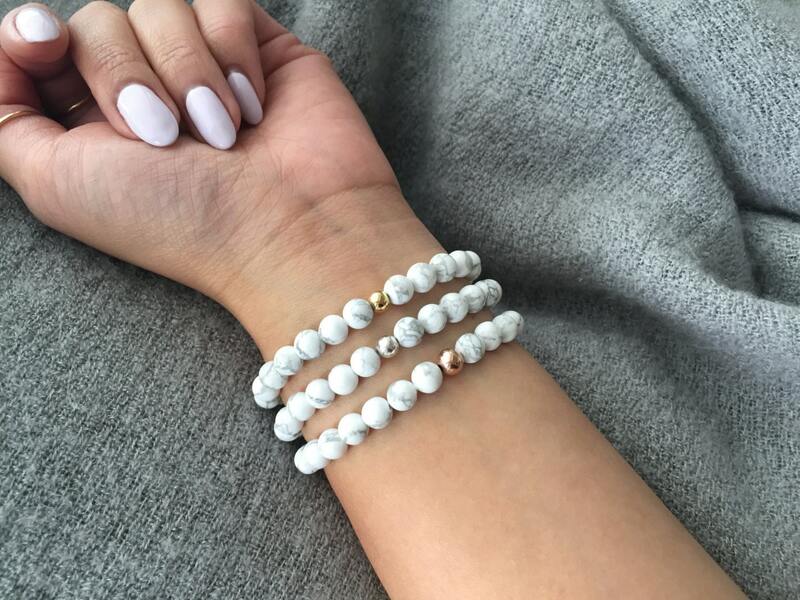 I love these little bracelets! The beads are a little smaller than it looks in the picture but they are still so lovely and so pretty. I can't wait to give them to my bridesmaids! Rachelle was so awesome and easy to work with. Even when I changed my mind about the sizes last minute and messaged her, she was about to mail them out and still fixed them for me that night! Would definitely recommend! The bracelet is gorgeous - I pair it with my watch and another bracelet every day. Perfect match! The packaging and hand-written note was a great touch! Thank you! The bracelet is beautiful and well made! It was a little wider than I was expecting, but it works!